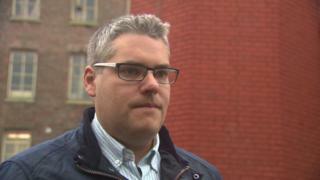 DUP MP Gavin Robinson has said it would be "a disaster" if there was no prospect of a Brexit agreement and European elections were held in NI. He was speaking after MPs voted to ask the EU to delay the UK's departure - due to go ahead a fortnight today. It was expected that European elections would not take place in the UK in May as the UK was to leave in late March. Speaking to the BBC Radio Ulster's Inside Politics, Mr Robinson questioned the need for a long delay to Brexit. The East Belfast MP said a short delay could be pragmatic but warned: "If it is an interminable delay where there is no prospect of an agreement - one that invokes the running of European parliamentary elections in Northern Ireland - that is a disaster for people that voted to leave the European Union in 2016 that in no way honours the expression of their will." The DUP MP added that if that happens "people talk about kicking the can down the road, that is about opening the can and emptying the can and chucking it in the trash". The House of Commons will vote on her withdrawal agreement by 20 March, after MPs agreed to ask the EU to delay Brexit beyond the current 29 March departure date. Tory MPs and the DUP are seeking further legal assurances over the deal. DUP MP Gavin Robinson also told the BBC that his party could only back a revamped deal if "Northern Ireland is treated in lock step with the rest of the United Kingdom". He said without that the prime minister "will not find our support for a deal." It is understood that contacts between Downing Street and the DUP will continue over the weekend. Stephen Walker presents Inside Politics on BBC Radio Ulster at 18:00 GMT on Friday and 13:35 on Saturday.